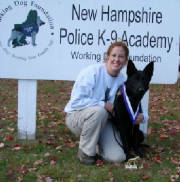 Congratulations to those who passed the Canine Good Citizen test on Oct.31st, 2009! Brandon was the evaluator and what a beautiful day it was. For those who did not pass, keep practising and come back in the spring! I wanted to let you know that last Saturday Oct 17 Alexis and I did the Iron Dog Competition. It is the one we did last year where Alexis won the fastest dog in the 100 yard run. Well, this year she was not the fastest in the 60 yard run but we did win the Iron Dog 1.5 mile course for my age group. We did the course in 17 mins and 50 seconds. Alexis was a super star.She did everything she was suppose to,even the jumps she did not do last year. :-) She just loves doing this. As we were waiting our turn to go she keep whining and wanting to go. People would want to say hi to her and she wanted nothing to do with them. She just wanted to go. After we finished she was so happy and anyone could come up and say hi. She was so happy to everyone. We actually beat all of the civilian woman teams. I think there were a total of 6. I forgot. Here is a description of the course. 13th Annual Iron Dog Competition, which required handlers and their dogs to navigate a roughly 1 1/2 mile course full of obstacles, crawls, hurdles and challenges requiring both animal and human to show their athletic ability. The event is held annually at the Working Dog Foundation's training grounds at the Pease Air National Guard Base in Portsmouth. The event challenges law enforcement K-9 teams and amateur pet owners to a day of fast-paced racing on a course designed to test how well humans can interact with their animals. This year's course required handlers and dogs to "low-crawl" under barriers, jump hurdles, find empty shotgun shells and hit targets with tennis balls. One portion of the course required the handlers to do push-ups and sit-ups while the dogs obediently sat and waited. Teams were sent out in staggered pairs, and the dogs were all required to be on leashes, so Saturday's event saw a lot of handlers appearing to be dragged through the course by their enthusiastic four-legged sidekicks. Alexis and I did the course in 17 minutes and 50 seconds. We won a trophy and medal for finishing first in my age group. Congratulations to Janet, Panzer & Elle! I am pleased to announce Panzer 's stellar performances at the Carroll County Kennel Club show in North Conway NH this weekend (9/5 & 9/6/09). On Sept 5th Panzer captured a 3rd place in Novice B, obtaining his first leg. He also took his first Rally leg with a score of 98 ( and his first time out)..
On the following day, Sept 6th he won 2nd place for Novice B ( his second leg) and in Rally Novice B he tied his score at 97 and gained his second leg and a 4th place ! 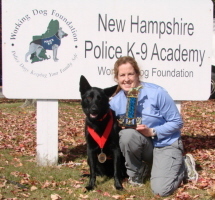 I am happy to announce that Onyx completed two titles: his RN and his CD on the same evening @ the Souhegan Kennel Club which took place at the American Kennel Club on 10, 9, 09! He completed his CD under Judge Susan King and his RN under Judge David Mauer. Elle competed on Sunday and was the tying score with Panzer with a 97, Elle was a bit quicker and she beat his time and gained her first leg with a 3rd placement for her Rally Novice B.
Congratulations! 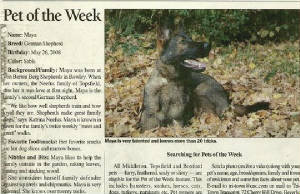 to the following pups & owners who passed the STAR Puppy test on 8/22/09. 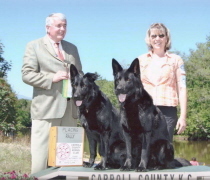 Our 2nd CGC test on 6/28/09 was a success despite the drizzle. Cogratulations! to you all and thanks to those who helped out! Your training and determination has shown and hope you continue to train and socialize your dogs. 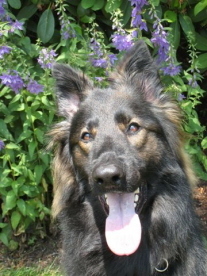 The next CGC Test will be held sometime in the Fall 2010 at NordOsten Kennel in Rowley..
Congratulations to Janet & Panzer Von Wispernden Keifern CGC TDI HIC. Panzer (aka Onyx) earned his HIC on 6/28/09! 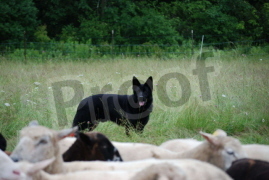 potential in him as a herder. 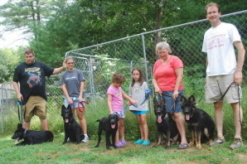 Congratulations to (left to right) Maureen & Juno, Kelly & Max, Trina & Arko, Taffy & Fenway, Katie & Brewer! They passed the S.T.A.R. Puppy Program on 4/11/09! Congratulations to the following dogs & handlers for passing the CGC test on 11/2/08! Congratulations to Sandi & Alexis! 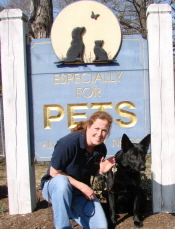 They passed the CGC (Canine Good Citizen) & TDI (Therapy Dog International) test on 3/28/09. Alexis is out of Zella von Barren Berg & Axel Vom BuckCreek.